Assorted varieties. 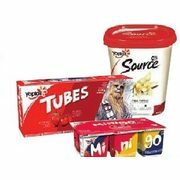 Yoplait minigo 6 x 60 g. Tubes 8 x 60 g. Source yogurt 650 g.
Imported from Norway. At the deli. $6.59/kg. Product of Mexico. No.1 grade.